Download the slides that accompanied the speech here. I want to begin with a story. I met Shem Lawrence at the 198 Gallery in Brixton in August. 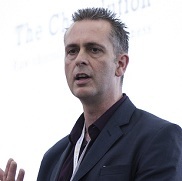 I had been invited to address a European conference on the subject of social enterprise in the UK. I couldn’t be there the whole day but arrived in time to eat. He came from Myatts Field North estate. Shem told me he had a social enterprise called Community Roots which was in its early stages. He told me he was using music and arts to help young people build their confidence and sense of identity. I encouraged Shem to apply to First Steps in Social Enterprise, explaining that I thought it could help Community Roots develop their business. Shem and his colleague Aisha joined the programme. They have worked hard to develop their social enterprise. Along with other participants of the First Steps programme they not only contributed to the course, but also contributed to the Bronze Woman’s 5th year anniversary by putting forward a colleague Caro, who performed a moving and beautiful poem at the event. A second conversation took place that day. I said I wanted to make a film about Bronze Woman, to mark the 5th anniversary but that Olmec had no money. Shem said “No problem, I will make it happen”. He introduced me to his colleague and friend, Oz, and on the 30th November Shem organised a film shoot. We were joined by Annetta, Kelly and a number of the First Steppers who, despite having been put through the final 6 hour First Steps in Social Enterprise session stayed until darkness fell. I tell this story because Community Roots is taking on the hard task of setting up a business. They are not primarily motivated by money, or financial gain. Their motivation is to create positive change in their community and earn a living in the process. 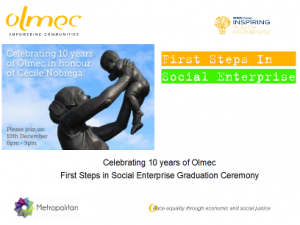 They embody social enterprise, and it is OImec’s role to help them and others like them to be successful. I want to thank all for being here. I want to thank all our speakers, I want to thank our partners Metropolitan Housing Association and the RBS Group who have sponsored this event and funded the last round of First Steps. Olmec is very fortunate to be blessed with a fantastic board, and a heritage built on the vision and hard work of exceptional people that we have heard from today: Mohni S. Gujral and Tanzeem Ahmed. I would like to thank our hard working and committed staff team, who make our work possible on the ground. Olmec’s mission, is to focus is race equality through economic and social justice . Programmes that empower people. Power? Empowering people? Real power is the economy, control over resources, money in your pocket. It means having a job, or setting up or owning a business. Olmec’s focus has been precisely that. Helping people to find work, or set up in business, ethical social enterprise business. Our Solid Foundations and I.comm team have built trust and relationships in communities, before providing the practical help that people need to find jobs, or training. Our social enterprise programmes support people with the tools that they need to face the challenge of setting up a social enterprise business. I have told you one story, but have could told the many others. I would like to share with you some of our achievements of the last 18 months. We have supported 100 people into work through our employment and training team. We have supported 63 minority and migrant led social enterprises through direct support. 46 migrant entrepreneurs have participated in the First Steps in Social Enterprise. Olmec CIC Director Nathan Brown has provided business advice to 12 BME co-ops. My colleague Mei Hui, has supported a further 15 minority led social enterprises. In addition to this, Mei facilitates a network of over 250 social enterprise. We mark 10 years of Olmec. We mark 5 years of Bronze Woman, and honour our departed sister Cecile Nobrega. We mark 50 years, of Martin Luther King’s speech at the march for equality and jobs, in Washington DC in 1963. I refer to the famous “ I have a dream” speech in which Dr King outlined his vision of an America , not just with equal rights legislation, but of an America free from prejudice, and people “defined not by the colour of their skin, but the content of their character”. We mark the 50th anniversary of the Bristol Bus Strike which lead to the first equalities legislation in the UK, 2 years later in 1965. Olmec belongs to this heritage, not through campaigning and political action, but through listening, engaging, and providing practical support to effect changes in people’s lives. We measure our success through the success in other people. We know that racism and prejudice and inequality persist in our society. Equally we know that racism and prejudice and inequality are unacceptable in 2013. Sexism, homophobia, transphobia, and all forms of prejudice are unacceptable in 2013. Sometimes these problems can seem daunting to confront as an individual. These problems can seem daunting even in organisations as we all fight for survival in this challenging economic environment. With this in mind, I pledge, to my colleagues at Olmec, to the board and supporters, I will do everything within my power to ensure that in another 10 years when we mark Olmec’s 20th year, we will have a set of achievements to match and with hard work, exceed those of the first decade. difference in your home, your workplace, or your organisation to challenge racism. I urge you to support this campaign and make a pledge. I want everyone in this room today to be that great generation.